The soft shell category isn’t defined clearly. Original designs prioritized breathability and quick drying over weatherproofing, but currently, the category can span garments that functionally act as hard shells to single layer, highly breathable wind shells. The items chosen for this test were not primarily insulators, nor were they hard shells. Compared to prior tests (where the jackets were truly just shells), the category has widened drastically in functionality. Some provide the same weather protection as classic hard shells, but offer more breathability, softer hand, and better drape. Others add warmth and can act as both the outer shell and a light insulating layer. Softshell jackets are tested across a broad range of activities and weather conditions to represent the widest combination of breathability and weatherproofing requirements, durability, compressibility needs and featured usage. Aerobic training, hiking, backpacking and all forms of climbing can all be utilized to test these garments, subjecting them to a wide array of stressors. Breathability was the original primary design goal of the first soft shells and is still a leading consideration, as getting wet from the inside can be just as serious a problem as getting wet from the outside. Durability is extremely important; in certain situations, failure of a layer can be catastrophic and a large part of perceived value centers around how long a garment lasts. Weatherproofing can be at odds with breathability, but in dire situations, this is the only factor that may matter. Until the miracle fabric exists, breathability and weatherproofing will have an inverse relationship; as one goes up, the other will go down. Fit/Comfort is highly personal, different body proportions and preferences steering evaluations of this department. Fit/Comfort will always be notated with the general dimensions of the tester along with any obvious anomalies to fit or comfort. Compressibility’s importance depends on the packing situation, but more compressibility will never be negative. 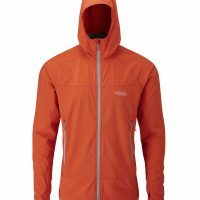 A jacket’s features can alter the effectiveness of the garment for each specific use; aerobic training demands a vastly different feature set than an alpine climber. Having too many features when not required affects factors such as compressibility, while not having a required feature when needed can be frustrating at best and dangerous at worst. 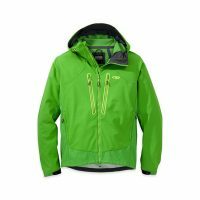 The The Mountain Hardwear Dragon Hooded Jacket is a highly wind resistant jacket with an interior fleece and mesh lining, making it warm and comfortable as a solo layer in shoulder seasons. These features place the jacket in the grey area between being a true shell and an insulating layer. The Dragon Hooded Jacket has a longer fit in both the torso and arms that works well for climbing movement and the array of pockets and substantial hood (that works great with helmets) add value for the alpine adventurer. All those features though put this jacket on the heavier side. The most breathable soft shell of the test was the Arc’teryx Gamma LT Hoody. Thanks to its mostly liner-less minimalist design and double weave Wee Burly fabric, the air permeability was plentiful and obvious. When highly aerobic, high output activity was on the menu, the Gamma LT Hoody was the one to get yanked off the hanger. The least breathable was the Marmot Zion Jacket, which could fill the function of a hardshell in nuking conditions, so the lack of breathability was the accepted trade for the high level of waterproofness, weather resistance, and warmth. The Outdoor Research Iceline scored the same as the Marmot Zion, but the Cordura/Spandex paneling did allow some perceptible breathability. 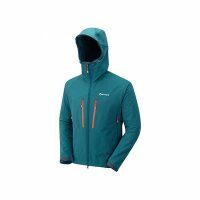 The Patagonia Kniferidge Jacket and Mountain Hardwear Dragon Hooded Jacket spanned the gap in breathability between the Arc’teryx Gamma LT Hoody and the Outdoor Research Iceline. The Outdoor Research Iceline, Arc’teryx Gamma LT Hoody, Mountain Hardwear Dragon Hooded Jacket and Patagonia Kniferidge Jacket all scored the same in durability, but the nod went to the Outdoor Research Iceline. It refused to show even the slightest sign of wear during the testing period, even when subjected to abrasion under load on rough and rocky surfaces, and the zippers and other components were all extremely robust. The Mountain Hardwear Dragon Hooded Jacket just nudged ahead of the Arc’teryx Gamma LT Hoody, but only by the nature of its heavier design (which made it the heaviest jacket in the test). The Arc’teryx Gamma LT Hoody was super durable for how light and breathable it was and for the environments that it would naturally encounter, there would be no issues with durability or longevity. The Patagonia Kniferidge Jacket got nicked because the nature of the Polartec Power Shield Pro made it more prone to snagging on tiny but sharp protrusions. Nothing ever penetrated the fabric, but it did get snagged on occasion. The remaining Marmot Zion Jacket, although scoring one point less, was highly durable, and giving it a lesser score was difficult to rationalize, literally coming down to a slight loss of adhesion on the wrist hook and loop closures. The clear winner in weatherproofing was the Marmot Zion Jacket; the seam taped Polartec NeoShell jacket was perfectly capable of acting as a hard shell in challenging alpine conditions, and all zippers were water resistant. The fleece liner added some welcome warmth when the temperature approached freezing. 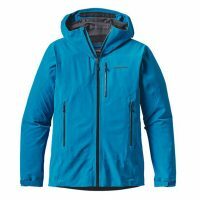 The Patagonia Kinferidge Jacket and Outdoor Research Iceline ranked next, with the slight edge going to the Patagonia Kniferidge since the entirety of the jacket was Polartec Power Shield Pro, and it lacked the less water resistant elastic paneling of the Outdoor Research Iceline. 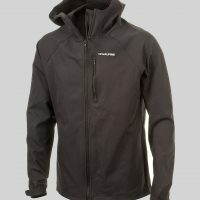 The Mountain Hardwear Dragon Hooded Jacket was next, not being nearly as water resistant, followed by the Arc’teryx Gamma LT Hoody, where breathability was the highlight. The Arc’teryx Gamma LT Hoody and Patagonia Kniferidge Jacket scored equally in this department, but the slight edge goes to the Gamma LT Hoody. The patterning of this minimalist jacket followed the contours of my body closely, but the inherent mechanical stretch of the material allowed unhindered freedom of movement and comfort. All this was dependant on my build, being slim but broad shouldered (32-inch waist, six feet tall, 165 pounds). The Patagonia Kinferidge jacket had a slightly larger and straighter cut in the torso, potentially fitting average builds better; the fabric was also stretchy, following body movements easily. The Marmot Zion Jacket and Outdoor Research Iceline were dead tied in the next slot as they had very similar cuts, comfort and freedom of movement. They both had a slightly shorter overall length than the other jackets, still plenty long to go under hip belts and harnesses, but less likely to get hung up on gear hanging on gear loops. 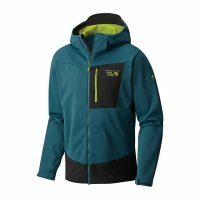 The Mountain Hardwear Dragon Hooded Jacket occupied the last spot in this department, hindered by overly long sleeves, which allowed fully covered and free arm movement overhead, but resulted in baggy arm fit otherwise. The Arc’teryx Gamma LT Hoody easily came out on top; its minimalist character and mostly unlined construction allowed maximum shrinkage, which made an often packed just-in-case layer. 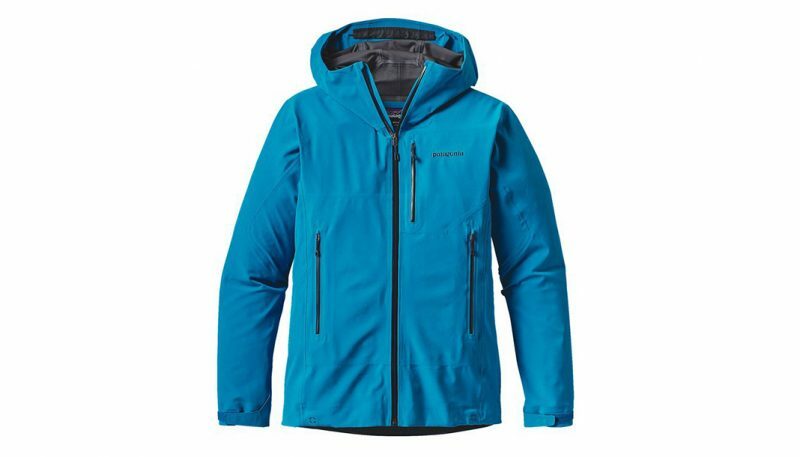 The Patagonia Kinferidge Jacket was the runner-up, it’s thin Polartec Power Shield Pro allowed impressive compression, which made it the smallest packing piece that possessed water resistance beyond just a DWR coating. The Marmot Zion Jacket was next, the heavier Polartec NeoShell and fleece liner limited shrinkage. 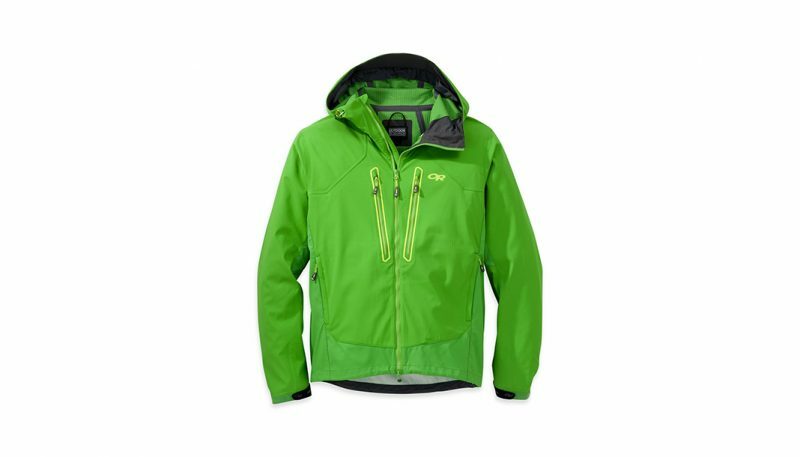 The Outdoor Research Iceline and Mountain Hardwear Dragon Hooded Jacket tied for the last spot; both suffered from thicker liner materials. The Outdoor Research Iceline pulled ahead in this department, its extensive pocket configuration (which included chemical heater pockets at each wrist) and alpine oriented details reflecting well thought out and intentioned design. The Patagonia Kniferidge Jacket was next; adorned with well-appropriated features that also served the alpine set well. One unique feature was the Cohaesive cord locks; discs that were easily found even with gloves on and actuated with a simple squeeze. The Kniferidge Jacket was also the only jacket with a Recco reflector. 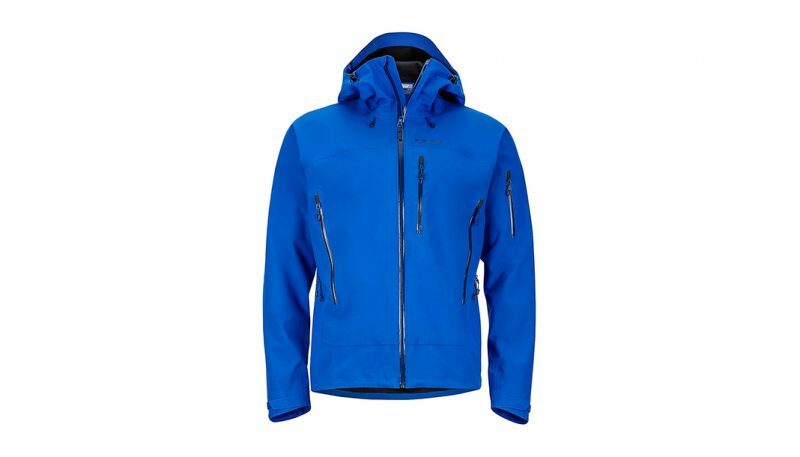 The Mountain Hardwear Dragon Hooded Jacket earned the third spot, and again alpine oriented features were the factor. This jacket had a comprehensive array of pockets and had the best functioning hood when wearing a helmet. The Marmot Zion Jacket was next, plentiful pockets (including an upper sleeve pocket) and full-length pit zips (the only ones of the test) were much appreciated. 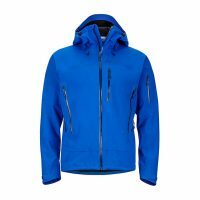 The Arc’teryx Gamma LT Hoody scored the lowest in this department, but by design, as this jacket’s minimalist feature set allowed it to shine in other areas. There is not a bad jacket in this test, but unfortunately, the “miracle” fabric that is waterproof yet highly breathable isn’t yet invented. Proclaiming a category winner is problematic as manufacturers target specific points on the waterproofness/breathability scale, producing garments that are specific to conditions and activity levels. The category no longer mimics the original designs that heavily favored the breathability side of the spectrum and many “soft shells” share only a category designation with the predecessors. The reality may be that the outdoor enthusiast that partakes in several activities in all conditions will desire a quiver of jackets. The Patagonia Kniferidge Jacket was the “winner,” as it scored well in all categories, but it wasn’t superior in any one characteristic. Outdoor enthusiasts can find more appropriate soft shell choices depending on what end of the breathability versus weatherproofing spectrum is desired. 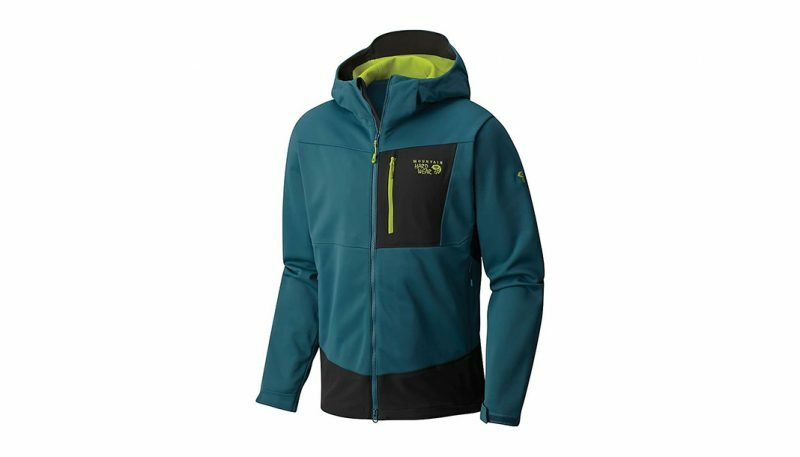 The Arc’teryx Gamma LT Hoody, for example, would be the jacket of choice for highly aerobic athletic pursuits, while the Marmot Zion Jacket might be the top choice for the alpinist looking to replace the classic hard shell. Predicting the weather may also steer the choice of the soft shell as would other layering pieces available. Softshell jackets have morphed into numerous functional variations in the short lifespan of the category. The original designs accepted that waterproofing and breathability were opposing sides of an equation that had no real solution; the softshell gave up on waterproofing to provide a windproof, insulating and water resistant “shell” that was superior at preserving the microclimate next to the body in conditions that didn’t involve heavy rain. 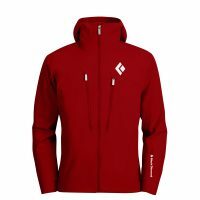 A windproof, yet air permeable shell material was combined with a wicking and insulating fleece type inner material. Avoiding moisture from the inside became the priority over avoiding moisture from the outside, and even light precipitation wasn’t an issue as wicking materials and high vapor transfer rates allowed body heat and convection to dry the garment in short order. Even when wet, these original designs felt dry as the inner liners were designed to have little contact with the body. 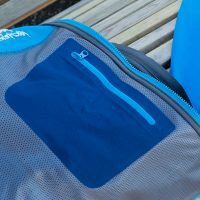 The softshell category has evolved in several directions, and the primary function of the category is hard to define. 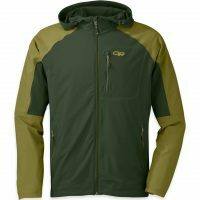 It seems as any jacket that can be worn as an outer layer that isn’t a classic, non-insulating, waterproof nylon shell is tagged as a softshell. 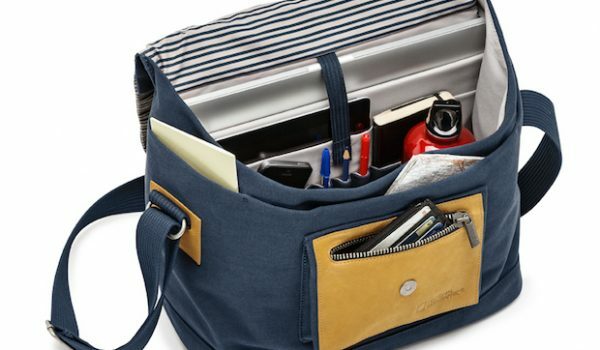 Modern versions of the original designs remain, some adding additional waterproofness. 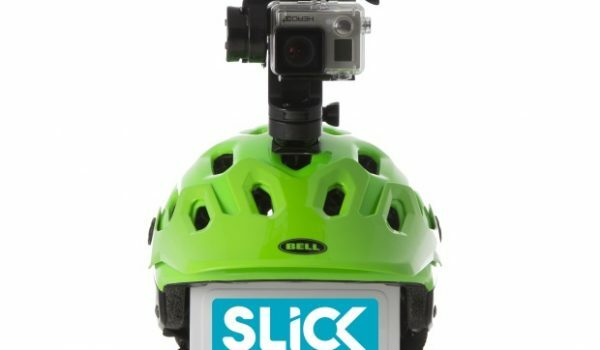 Some have stripped down to a soft handed windproof and water resistant single layer shell. 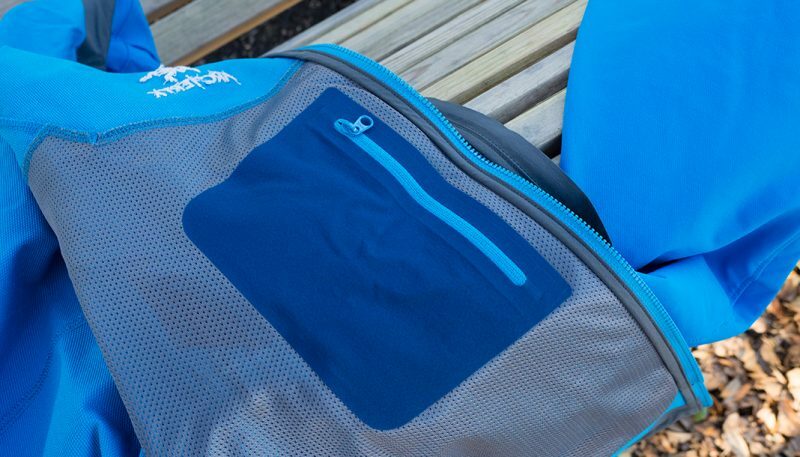 Some have jumped the gap to have the same waterproofness as a hard shell, but promise better breathability and softer, quieter and more pliable fabric. 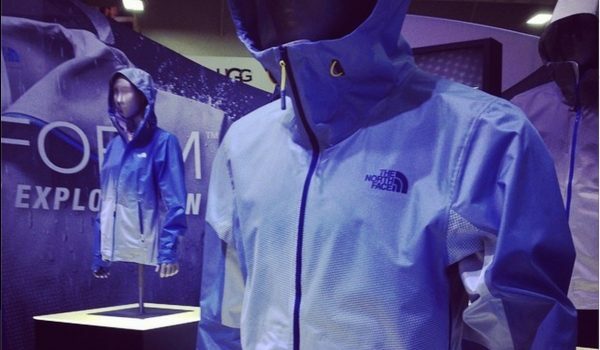 The original opposing factors of waterproofness and breathability still exist. The manufacturers still have to choose a position along the spectrum to occupy. This test involved jackets that are on the far ends of the spectrum as well as innovative attempts at being the happy medium. The main factor in the decision of which softshell jacket is best involves figuring out what part of the waterproofness vs. breathability range your conditions and activity demand. Pricing varies widely; this test had MSRPs priced $225-$449. Fabric technology drove much of the pricing. The newer fabrics that claimed a high degree or total waterproofness while still being somewhat breathable were the most expensive, while the simpler fabrics that relied on only a DWR coating to resist water but were more breathable tended to be less expensive.